To begin with: "Our" Museum is located in the heart of Norden, which can be reached from a small lane (opposite the “Cafe ten Cate”) in the “Osterstrasse”. Ideal for tourists and old friends of Norddeich Radio! Many former colleagues will remember the old building, which is about 130 years old and of course under monument protection. 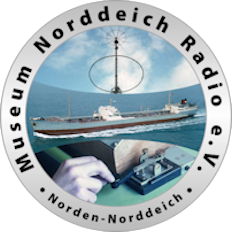 The members of the Museum originate to 90 percent from the services at Norddeich Radio, from the radio service, the technical department, the distance write service and senior management. March 21st 2015 we have officially opened the Museum with a small ceremony after a long preparation time. A „small ceremony“ proved to be a clear understatement as the room in the „Mittelhaus“, Neuer Weg, was completely congested with people not permitting everybody to have a suitable seating arrangement. In addition to the Deputy Mayor of the city Norden, Babara Kleen, several other representatives of public institutions of the city were present as well as other important friendly clubs devoted to the “Museum Norddeich Radio”, such as the "Seefunkkameradschaft Bremen", “Seefunk FX Intern e.V. Rostock", „MF-Runde (Marine Funker)”, Heimatverein „Norderland“ e. V.”, "Freunde der Seefahrt, Emden","VFDB ( Verband der Funkamateure in Telecommunikation und Post)”, “DGzRS (Deutsche Gesellschaft zur Rettung Schiffsbrüchiger)”, “Arbeitskreis Norder Museen“ and many radio amateurs from different locations all over in Germany. On the opening day all visitors to the Museum expressed their positive impression about the interior outline of the building, which is of course has been noted with pleasure. Many thanks to all who have supported us to generate this Museum! Listings of the individual displays at this point would lead too far. In general, it can be said that 95 percent of the shown devices were actively used at Norddeich Radio, including a transmitter from the transmitting radio station Osterloog. The receivers are ready for operation again, the morse puncher and donors from the region of "one way traffic" are fully serviceable. Teletype and strip scribe from the "Teletype department" are available. To demonstrate the counterside of radio operations with Norddeich Radio, we have restored a complete ship radio station. It was taken from the former fishing vessel "Frithjof". After decommissioning, the vessel was used as training ship, renamed "Emsstrom" and located many years in the port of Leer. Later the vessel was sold to Panama and sunk on 14th January 2013 after a collision with its own tug in the English Channel.